Boyne City's Cora Hauger gets in the way of Alpena's Anna Young in the first half. 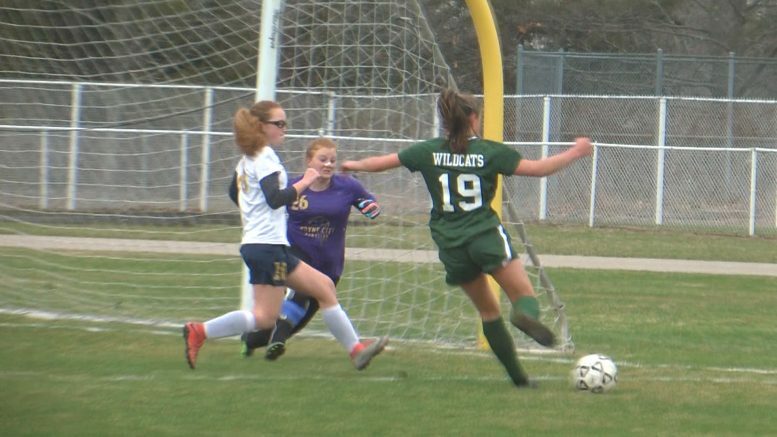 Alpena, Mich — The Alpena girls soccer team ran off to a 2-1 start during their 3 game opening road trip. They played their first home game of the season against Boyne City Tuesday evening and lost 2-0. The Ramblers got goals from Jordan Noble and Inanna Hauger in the first half on two breakaways. The Wildcat offense was able to apply more pressure in the second half, but was out shot 12-3 by the game’s end. Storch also added that Boyne City out-ran the Wildcats throughout the game and that he needs the team to commit to running. The Wildcats are back at home on Thursday when they face TC Central at 6:00pm. Alpena’s defense will be challenged against last year’s Big North Conference Player of the Year Anna Wuerfel.